The Cathedral of Lucca „Cathedral San Martino“ belongs to the great churches in Tuscany. It is by far not as popular among tourists as the cathedral of Florence, the cathedral of Pisa, but still very well visited. The Cattedrale di San Martino is the cathedral of the archdiocese of Lucca. It is not far from the railway station, which is on the other (outer) side of the city wall. 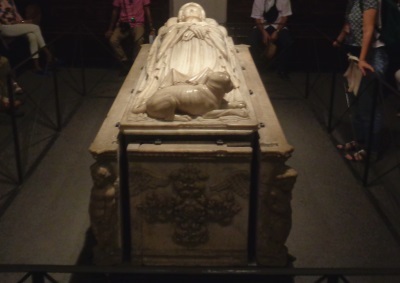 The most important monument inside the cathedral of Lucca is the sarcophagus of the Ilaria del Carretto (picture below). The work of art on the sarcophagus is by the famous artist Jacopo della Quercia (1406). It can be found in an adjoining room on the other side of the cathedral (seen from the side entrance for the paying visitors of the cathedral). In the cathedral San Martino Lucca you can also see many pictures on the walls. Some of them are famous works of art. The most famous painting is probably „Last Supper“ by Jacopo Tintoretto (altarpiece). 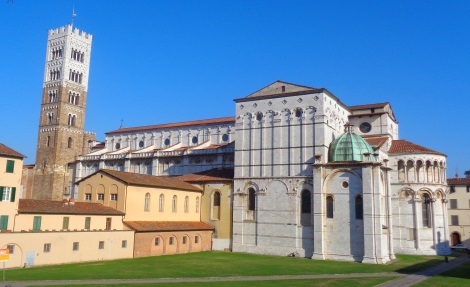 As a tourist you can also climb the tower of the San Martino Cathedral and visit the neighbouring Cathedral Museum of Lucca. Both are worth to see. At the entrance to the tower there is a public toilet. The tower of the cathedral is only one of many famous towers in the old town that can be climbed as a city visitor. Lucca is considered as the „city of the towers“. The Cathedral „Cattedrale di San Martino Lucca“ is located in the old town, not far from the entrance to the old town railway station. In the Museo della Cattedrale di Lucca (Cathedral Museum) there are other works of art and objects from the church on display. Some valuable paintings and sculptures have been removed from the Cathedral and brought to the Church Museum, for safety reasons among others. 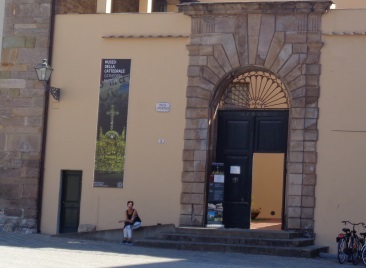 The museum „Museo della Cattedrale di Lucca“ is directly opposite the church in the Cathedral Square of Lucca. Caution: Many other churches in Lucca have a lunch break about 12 o’clock to 15 o’clock, many churches and museums in Lucca have on Mondays no opening hours.